I love circus books. I love Dr. Seuss. So when I was given ‘If I ran the circus‘ by Dr. Seuss I was excited! 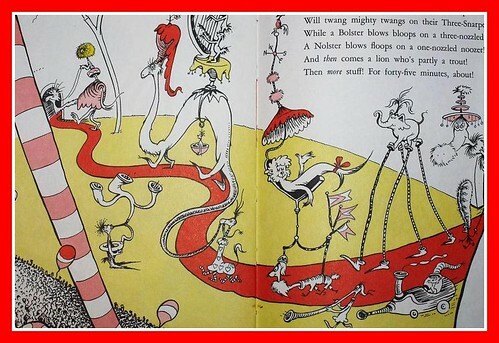 Unlike a lot of books aimed to be read by children Dr. Seuss books are fun to read! The plots aren’t mind numbingly predictable and the vocabulary is nicely varied. But the thing that always made them stand out to me was the superb illustration. The amazing colours, characters and even the lettering made Dr. Seuss books a joy to read. ‘If I ran the circus’ is no different, as you might imagine it’s a brilliantly surreal take on traditional circus (I’d guess mostly heavily influenced by Barnum & Baileys). Elephants on stilts, a walrus who can stand on one whisker, a juggling dot “Who can juggle some stuff, You might think he could not” and many more amazing attractions feature in ‘Circus McGurkus’ which the book centres around. It’s a fun book, perfect for any youngsters learning to read or possibly any circus performers looking for some inspiration! Being half french means half my family live in France. I was recently chatting with my grandparents over the phone and they were telling me they had watched 3 Circus programs on TV that day; one was the “International Festival du Cirque de Monte-Carlo” (an annual Circus festival and competition held in Monaco), the second was “Sous les etoiles du cirque de pekin” (A Live Stage/TV Circus show based on Chinese Hero Mulan from what I can make out.. ) and the third was “Le gala de l’union” which I think maybe the French version of the English Royal Variety Performance in a Circus big top with circus acts… And, of course, the next day they indulged in more quality circus with “Le Plus Grand Cabaret du Monde” – A top quality televised Cabaret regularly aired in France which our very own CircusGeek Founder Arron Sparks has starred in. I enjoy watching Circus as much as I enjoy performing it so when they told me about what they’d watched I was a bit jealous to say the least… It got me thinking and asking the question – why is there hardly any Circus coverage on UK television? Is it just the UK that doesn’t have much coverage or are other countries the same? It’s probably worth noting that the reason there was so much circus on TV in France when I spoke with my grandparents was because of the festive season, with the exception of Le Plus Grande Cabaret Du Monde I don’t think they broadcast circus on a regular basis. However it is still a lot more than we get in the UK. Although it is possible to see some quality Circus Acts on the box these days here in the UK, it seems they are always linked with a reality TV show or game show where the actual Circus Act is not really the main focus. I suppose it’s down to a number of reasons, obviously and primarily it’s down to the broadcasters wanting to get the maximum viewing figures and Circus isn’t number one on their list for boosting their audience, which is understandable considering our general publics view on Circus. I guess the second main reason is the quality and type of circus happening in the UK right now, for instance if there was an International circus competition hosted in the UK such as Cirque de Demain which would bring the best of the best in Circus to the UK I’m pretty confident that would get some coverage, even if it was at 3am, at least it’s a start. The quality of traditional circus in this country has deteriorated which doesn’t help the case. And “New” circus which is being created is more aimed at Theatres and is reaching in other directions, so it leaves the TV producers with nothing to work with really. There is a lot of talk about developing Circus audiences and generally developing Circus in the UK and unfortunately it seems the best way to reach an audience is through TV. To me it feels like the people really pushing the Uk Circus scene are more concerned with creating thought-provoking / narrative lead work which is great for a seasoned theatre audience and I have no problem with – as it is developing a new type of Circus, BUT it is completely unreachable for the general public who at the end of the day already have their pre-conceptions of Circus and will never go to a Theatre to see the latest developments in UK Circus. There’s nothing to bridge the gap and get the general public to, firstly, appreciate Circus as Circus, which gets their attention and then, secondly, introduce them to where else Circus can go. Why is it that few modern circus artists seem to know or care about the history of circus? The job of an artist is to be creative, rather than recreative. Knowing the history of your discipline is important; You don’t want to merely repeat what others have done before you. It’s a good idea to know the history of the genre you’re involved in and possibly the history of other related disciplines. In a world where we know ‘knowledge is power’, why would anyone not want to know as much as they can about their passion or career? With this in mind, why can I still have a conversation with a professional who knows nothing about the history of what they are doing!? I’m not saying everyone needs to be an expert or want to be on Time Team, but please take the time out to educate yourself, just a little.